A social, cultural, and political category that refers to the "dominant" culture of the U.S., a category primarily understood as a racial construction that expresses the legacies of Western European hegemony. Many critiques of "whiteness" exist. General analysis suggests that whiteness has functioned since the early Enlightenment period in Europe (the late sixteenth and early seventeenth centuries) as an expression of increasingly dogmatic, or strict, white supremacist, patriarchal, heteronormative, and classed biases. Although since at least the 1960s critical racial and comparative ethnic frameworks, in addition to versions of feminist and queer theories, have challenged the privileges that have inhered in "whiteness," critical indigenous critiques comprise a burgeoning field of scholarship and activism that also challenge the colonial settler histories and contemporary practices associated with whiteness. 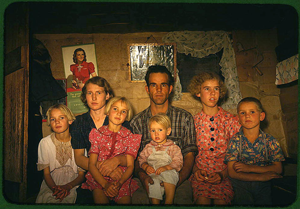 "Jack Whinery, homesteader, and his family, Pie Town, New Mexico, October 1940" by Russell Lee is licensed under Public Domain. 1992 Decolonizing Feminisms: Race, Gender and Empire. London: Routledge. 1993 Whiteness as Property. Harvard Law Review. 106(8): 1710-1791. Politics. Philadelphia: Temple University Press.